IMAGINE waking up to vast ocean views and the sound of waves crashing and seagulls squarking, only to realise you're not actually at sea. The noises you're hearing are actually being played over a loudspeaker to simulate the experience of being on a cruise. 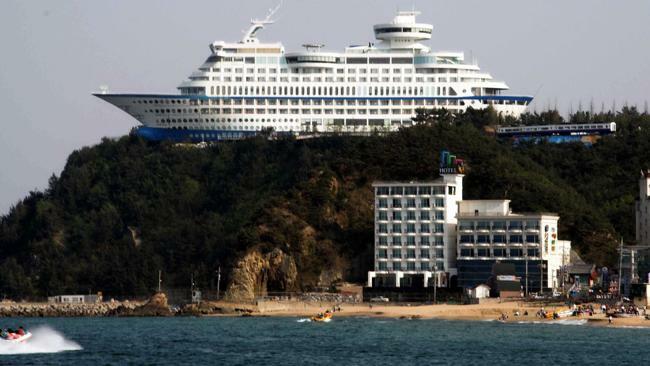 This is what travellers experience at Korea's Sun Cruise Resort, the world's first on-land cruise themed resort. The hotel is actually a 165 metre-long, 45m-high cruise ship that weighs in at 30,000 tonnes and sits perched on the edge of a cliff. Located in Jeongdongjin, it offers 'cruise conditions' for those who don't have the money - or the time - to go on a real cruise. The hotel has 211 nautical-themed rooms, restaurants, a golf range, gym, revolving sky lounge, nightclub, karaoke and pool. It opened in 2002, and 11 years later it's become one of the most popular attractions in South Korea, according to the local government. But not everyone is a fan. The tourist who took the photo above, who goes by the name Parhessiastes, said: "Wow, this hotel is a blight on the landscape ... it's freakish and ugly." The hotel sits on the edge of a cliff in South Korea. IF YOU PREFER A REAL CRUISE! Try River Cruises in Europe. Send us your story about your cruise experience.